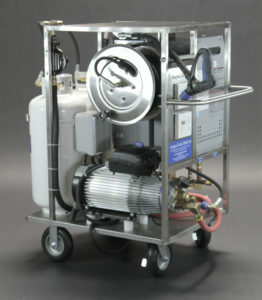 Since 1985 AaquaTools Incorporated has been a manufacturer and distributor of high quality high impingement water-driven products and solutions including high pressure washers, rotatory jet-heads, steam generators, spot-free rinse systems and flat surface cleaners to a select group of industries. Our success can be attributed by our ability to find a water cleaning need and fill it with a tool that we manufacturer ourselves or distribute for others. The majority of our devices are water-driven with low flow yet high pressure which creates high impingement cleaning and saves water. We have featured the KEW line of high pressure washers for over 20 years because of their ability to produce flow high enough to drive our tools and their unparallel track record of performance and reliability. Though our main business relationships are with the wine and food processing, automotive and transportation and industrial and solid waste industries, we welcome any industry that could benefit from our over 20 years of expertise. AaquaTools has quickly grown over the years to be the wine and food industries largest single supplier of water-driven high impingement cleaning solutions. This success is attributed to our unwillingness to compromise on quality and performance and our vision to develop water-driven tools to fill voids in the sanitation process. We have found the Tip-Too Cleaning System to be an effective, simple and fast way of washing our carts. Compared to our previous method of washing by hand with a pressure wand, the system is much cleaner and less labor intensive. The two biggest advantages of the system are the versatility and simplicity of the system. We wash 240L and 360L carts from various manufacturers, and the system is easy to adjust on the fly to fit all of our carts. As the system is simple and modular, replacement parts will be easy to find if there are any issues in the future due to normal wear and tear. The AaquaBlaster we purchased from AaquaTools works great. We use it on all our barrels, tanks and kegs. I no longer have to crawl into tanks for cleaning. I just hook up the AaquaBlaster to our KEW 5003V and set the temperature to 185° and walk away. The 30 kW steamer that we use from Aaquatools is an awesome machine. I have researched/used various steamers and been told by other suppliers you cannot reach 200+ degrees using two steaming wands (for wine barrels). This is not the case with the 30 kW Reimers Steamer provided by Aaquatools. Moving to a new company in which I inherited this steamer, I rented wands that read temperature within the barrel to test the machine. It easily reached 200+ degrees inside the barrel within 4.5-5 minutes. The prior product I used could not do so using even a single wand. I highly recommend this steamer for wineries looking to steam barrels both efficiently and correctly. At Chateau Potelle, we have been using Aaquablaster for about 1 year to clean our barrels. We have been very happy with the performance and reliability of the Aaquablaster. It is a sturdy barrel washer and the most important for us is that it does a very good and consistent cleaning of our barels. We have been very pleased! We have been very pleased with the CartBlaster. With over 25,000 carts to maintain the CartBlaster is much more efficient and pleasant to use as opposed to washing them with high pressure wand and having debris blow back in the face of the worker. Outstanding customer service. It gives us confidence knowing that we are killing bacteria with our HotCart and AaquaBlaster. Our work environment is cleaner. Clean up is quicker. We really went back and forth regarding our decision to purchase the AaquaTools Hot Cart. Buying the Hot Cart was the best decision we made. It already has paid for itself in 2 weeks. The combo of power and heat generated has been invaluable in our startup winery. I honestly cannot envision running a winery without one. Our HotCart3 has been flawless since we purchased it. I’m especially impressed with the efficiency of the tankless water heater, also how quiet it is when we utilize the hot water generator without the pressure washer. One suggestion; the piping coming down out of the water heater could use a bracket for support. My fear is that while moving the HotCart if the water supply hose were pulled on, it could potentially cause damage up into the tankless water heater itself. I wanted to thank Steve for picking up the phone and talking with me and our Mechanic; Mario Balcazar. He was very helpful and we look forward to better service and responses from this company in the future. We care about the health of our seasonal creeks. I’m a site manager for Waste Management and I recently purchased a CartBlaster from AaquaTools, Inc. The CartBlaster has been a God send. We are in the process of cleaning about 2,000 dirty carts for a new town contract that starts January 1, 2007. Without the CartBlaster this task would have been unmanageable to say the least. The CartBlaster has given us the freedom of using a lot less man hours devoted to this project. Our CartBlaster is connected to the least amount of pressure that is required for the operation of this unit, and the CartBlaster still performs at an outstanding level. We are very pleased with our purchase and would recommend this product to anyone wanting to clean carts and save $! I recommend this unit for those who want truly clean barrels. We have been using the Aaquatool pressure washer with the ICS Blst-N-Vac barrel washer for about a year and a half. The high temperature and pressure water combines with rotating spray jets keeps our barrels tartrate free for more effective cleaning and “sanitizing” with ozone or SO2. The vacuum empties 99% of the liquid from the barrel for easier handling and less mess. We have washer over 2000 barrels and the unit has been mostly maintenance free during this time. The few replacement parts we needed were available within a couple of days. I recommend this unit for those who want truly clean barrels. Aaquatool is the premier device for this application! I purchased and did my best to destroy an Aaquatool 360 (or prior incarnations) at Abacela Winery in Oregon and again at Agate Ridge Vineyard, also in Oregon. Despite my best efforts those units are still going strong. I have no doubt Aaquatool is the premier device for this application.